2 Timothy 1:10 (KJV):…But is now made manifest by the appearing of our Saviour Jesus Christ, who hath abolished death, and hath brought life and immortality to light through the gospel. It is one thing to have the revelation of life, to understand that the life of God is in you and that it revitalises your mortal body and kills the transactions of the flesh but it is another to have the revelation of both life and immortality. This is the purpose of the gospel! 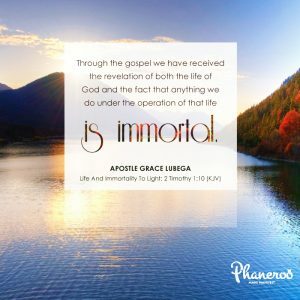 Our theme scripture says that it has brought life and immortality to light. It means that through the gospel we have received the revelation of both the life of God and the fact that anything we do under the operation of that life is immortal. Without this revelation, people walk in the darkness of two things: the fear that some thing will die and the further fear that if it dies, it will not revive again. Child of eternity, not only do you have the God life but whatsoever you do and have in God is immortal. Hallelujah! Through the gospel we have received the revelation of both the life of God and the fact that anything we do under the operation of that life is immortal. PRAYER: My loving God, I thank you for this day. I am grateful for this revelation and the weight of this truth! Oh, how great is this understanding! I have the life of the Spirit and whatsoever I do and touch will never die. My ministry, vision and everything about my life demonstrates the life of God but deeper than that, they will never die. In Jesus’ name. Amen.